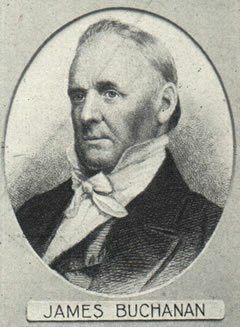 James Buchanan ("Old Buck") was the 15th President of the United States of America. He was elected President in 1856 and served from March 4, 1857 until March 4, 1861. He was the last pro-slavery President and was a member of the Democratic Party, but did not own slaves himself because he was from the free state of Pennsylvania. The Dred Scott decision was announced on March 6, 1867, making the issue of slavery the center of national discussion during his presidency. This page provides links to essays on James Buchanan, or to events during his presidency, by William P. Meyers, as well as links to external Web sites with related information.